You can now subscribe to SnoutCast, the bi-weekly podcast wherein DeeAnn and I talk about The Game, other puzzle hunts, various tabletop and video games, and random word definitions! I just finished reading The Life And Times Of Martha Washington In The Twenty-First Century, the oversized hardback edition of the epic comic book series by Frank "300" Miller and Dave "Watchmen" Gibbons. This book has a cover price of $100. It's 600 pages long and weighs over seven pounds without the slipcase. It's a good book, and I never would have bought it myself, but I got to read it and enjoy it for free, thanks to my local public library. My wife and I live in the Portland (Oregon) metropolitan area, which means we have access to the Multnomah County Library in Portland proper and the Fort Vancouver Regional Library, just across the river in Washington state. Even better, both library systems have online catalogs, so you can search for the exact book you want. The best part is that both libraries allow patrons to place any book "on hold." Back in Mountain View, the library would only allow you to put something on hold if it was checked out--if the book was on the shelf, you had to go find it yourself. Not here. Even if a book is shelved, tireless Portland and Vancouver library staff will retrieve it for you--from anywhere in their system--and send it to the "hold" shelf at your preferred branch. Once that's happened, you'll get an e-mail telling you the book is "on hold"--only your library card can check it out--as long as you pick it up soon (within ten days in Vancouver; seven in Portland). After you've got it, you can also renew it online, unless someone else has put it on hold after you. The only way this could be more convenient is if, like Netflix, the libraries mailed books directly to us. And they actually do offer that service--in Vancouver, you need special approval; anyone can request it in Portland for $2 per book plus return shipping costs. But it just seems wrong for us to be that lazy, especially when running errands is one of the few things that gets us out of the house these days. The big advantage for us is being able to create something akin to a Netflix "queue." We tell the library what books we want to read, and they tell us when those books are available. I put Superfreakonomics on hold in Vancouver last month, and I'm now up to #20 on the list, but I'm in no hurry. Portland has a great graphic novel collection, and I was able to catch up with DC's insanely insane Final Crisis stuff without having to track down individual issues at comic shops or spend money on trade paperback collections that I'd only read once. This also makes for some pleasant surprises, when we get pickup notices for books that we'd put on hold months ago and then forgotten about. I've currently got two books on hold that the library hasn't even purchased, because they haven't been published yet. But I know I'll be able to read them when they are. None of this takes away from the fact that I love owning books. It still requires non-trivial self-control to limit my purchases every time we hit Powell's. It's just really nice to feel like at least some of my local tax dollars are going to support a great service that we use quite a bit, and from which we derive great personal benefit. I didn't ask my country to do this for me, but I'll take it! Friday Flash Fiction: "The Gift of the Maggie"
A day late and a dollar short, as they say. Friends and family: If you did not receive a holiday card from us, please accept our profuse apologies for the oversight. Our contact list may be out of date. Send us your home mailing address and we'll make sure you're included next year. Meanwhile, everyone and their dog can read our exciting 2009 family newsletter (below). Apologies for the audio artifacts this time around. I forgot to unplug my laptop before recording and had to remove the 60-cycle hum (and harmonics) using a software notch filter. Which is ironic, because I warned about this very problem on the Wired How-To Wiki. 01:25 - shout-out to our two confirmed listeners! 02:10 - "Which Game had the most coherent story?" Just... just watch it. Now. I'll wait. Clement Moore's "Twas the Night Before Christmas"
O. Henry's "The Gift of the Magi"
...and a little gem from 1922 that you've probably never heard of. Hint: I'll be doing a few different British accents. Tune in any time between 4:00 PM Friday (today!) and 10:00 PM Saturday night to see a colorful parade of entertaining and interesting personalities from Portland, Oregon (complete schedule here). You don't even have to close your laptop. And it's all for charity! Friday Flash Fiction: "The Stories We Tell Ourselves"
It's been a tough week. I guess I should thank Neil Gaiman for his advice: Make Good Art. Or, at the very least, try. We weren't ready for her to go. We never would have been ready. Not only do we talk about old people, DeeAnn and I also talk like old people in this podcast. It's a performance. Like improv! As far as you know. 10:55 - the origin of "we're not having fun anymore"
You can also hear Jasper-cat yelling in the background every now and then. [This] assumes you are minimally competent to copyedit your own work and are competent to do a basic design for your book, either on your own or using the default settings available on Lulu or other similar services. If not, you can hire people to do these specific tasks, which is still very likely to be cheaper than a suite of services you would buy from a vanity publisher. In related news, there's been a bit of an online brouhaha surrounding romance publisher Harlequin's announcement that they're launching their own "vanity press" imprint! They got spanked pretty soundly by several trade organizations, including SFWA, and that's all I'm going to say about that! Friday Flash Fiction: "On Orbit"
I liked Deep Space Nine. I did not like Defying Gravity (or Virtuality, for that matter). I liked some of Babylon 5. And I love the NASA App for iPhone. Last weekend, at OryCon 31, I ran two Open Read & Critique (ORC) sessions. I've done writing workshops before, but this was my first experience with the ORC format (called "rogue workshops" in other places). There were a lot of unknowns this year; the ORCs used to be an unofficial, late-night thing at OryCon, and this was the first time they were scheduled in the afternoon alongside other panels. I think the ORCs went well, and I was impressed by the quality of all the pieces read and everyone's critiques, but I have some ideas for better time management in future programs. Where n is the number of participants; R is the time to read a single piece; C is the time for each individual critique; and D is the discussion time at the end, when an author can respond to questions. Long story short, we set T=60, R=5, and D=2, and we can fit 4 people into one hour if C=2, and 5 people if C=1. Any less than that and most people won't be able to provide a useful critique; any leftover time can be added to D, since most writers never seem to tire of talking about writing. Q.E.D. Applying these equations to other writing workshops is left as an exercise for the reader. I may post more about this year's experience later, but for now, here are some totally misleading statistics. The official nanowrimo.org word tracker (shown below) is wildly inaccurate, because at least twice (including last night, when I did 7,300 words), I updated my total after midnight, and so it was added to the next day's count instead. I would really prefer to be able to manually assign my word counts to specific days, since until the verifier goes live on November 25th it's all manual updates anyway. Because of OryCon 31 and other obligations, I only actually spent 15 out of 30 days writing this year's novel. My lowest word-count day was 570 on November 17th, and my highest was 10,700 on November 30th (which may also be the most words I've ever written in a single day for anything). My mean average word count per working day was about 3,400. If I throw out the highest and lowest outlying data points, it's 2,900. But first draft is not my problem. Revision is what kills me. Yes, I know this is a day late, but it's not like you couldn't have found this week's story otherwise. I really only post these pointers for the sake of completeness. After writing one "GC Musings" blog post in September, it occurred to me that any such discussions should include my lovely wife DeeAnn, who's been an integral part of every Snout Game. She handles the budget, most of the logistics, and many other planning aspects. As the latest of our various experiments, she has grudgingly agreed to join me in an irregular podcast about games (note lowercase "g"--we will definitely talk about puzzle hunts, but we reserve the right to digress). Oh, yeah, it's also 53 freakin' minutes long. Show notes below so you can skip all the boring stuff. 00:50 - We start with the profanity right away. 50:21 - Happy Thanksgiving! The end. P.S. If you'd like to join our zombie-killing party sometime, we're sparCKL and SoleChen on Xbox Live. EDITED (10 Jan 2015) to fix broken video and photo embed links. 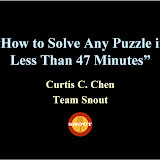 For those who couldn't attend, here's a recording of the puzzle hunt talk I gave at Ignite Portland 7 on November 19, 2009! The talk includes a walk-through of one Clue from the MegaHard Game (2000), and I love that several people in the audience applauded for the "a-ha" moment and the solution at the end. That's what it's all about, folks. Thanks to all the Ignite Portland staff, volunteers, speakers, and attendees for contributing to a great event, and to Jeff Stribling of MegaHard GC for providing a copy of the Clue for me to photograph. Friday Flash Fiction: "Rieta Linbitter's Backstory"
Apologies if you stayed up late last night waiting for this week's story. Blame Ignite Portland 7. I'm not saying I wouldn't want to be Ray Bradbury's friend. I just don't think he would click "confirm" on that request. What I'd really like to know is which connection Facebook mined to determine that I should be friends with Mr. Bradbury. Lacking any other evidence, I (as so many others have) choose to blame Scalzi.